Lot 144 A Pair of Cast Iron Plates. 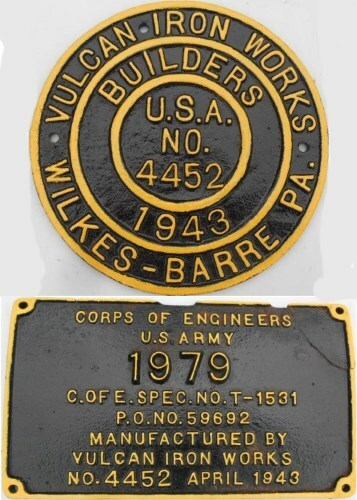 C/I Circular Steam Locomotive Worksplate "VULCAN IRON WORKS - BUILDERS WILKES - BARRE - PA. - U.S.A. No 4452 - 1943. Along with a - Rectangular C/I Numberplate from the same Loco "1979 - 4452 -APRIL 1943". Both front restored condition.